SDC’s sliding design skeletal is well known for its rugged construction and maximum reliability. The recent redesign of SDC's extending skeletal has enhanced the aesthetics and ease of operations. There are 2 different neck depths for the customer to choose from, this flexibility guarantees compatibility with operational needs. An under mount refrigerator can be specified as a bolt on option at point or order, or as an aftermarket solution. SDC’s skeletal trailer can be configured for specific container combinations, minimizing the unladen weight. Can be configured for: 20h, 30', 40', 45', 13.6m intermodal swap body or 2x20' containers. Minimal moving parts ensure maximum reliability and low maintenance costs. 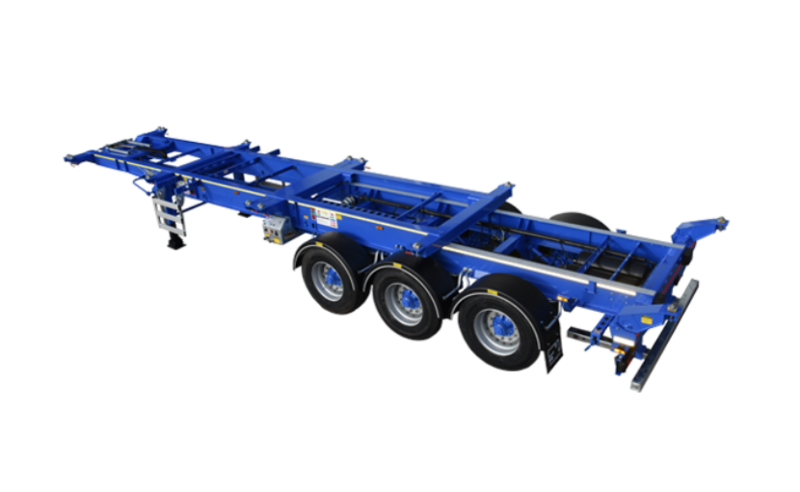 Where the trailer must move for its functionality, high grade steel is used on all components and the chassis is fitted with a stainless steel wear strip. SDC's skeletal now has only two running positions. These positions are clearly identified and colour coded for ease of operator use. To enable the trailer to legally carry a 45ft container, it is fitted with a galvanized pull out crashbar. For ease of operator use, a pull out galvanized coupling is also supplied. SDC's premium components including BPW, SAF, JOST, Haldex, Knorr Bremse, Wabco, Trucklite, Aspoeck, Contential, Goodyear, Michelin and Bridgestone to name but a few.